We recommend that you check cargo first to be sure that the trailer is loaded heavier in the front. If not, reposition the load so you get 10% of the total trailer weight on the tongue. Next, make certain the rear of the tow vehicle is not overloaded. Then check for wheel wobble on both vehicles caused by bearing failure, loose lug nuts or loose spindle nuts. Now check the tow vehicle's suspension alignment. For more information, go to the Owner's Manual and see the SafetyTowing section. Swaying (or whipping) of a tow vehicle/trailer combination at low speeds may get worse as speed increases. If this happens, take your foot off the gas pedal. Steer straight ahead while manually applying the trailer brakes. Then brake gently after the combination has begun to stabilize itself. Stabilizer or weight equalizing bars will help reduce trailer sway and may also be required by law in some states. Check cargo first to be sure that the trailer is loaded heavier in the front. If not, reposition the load so you get 10% of the total trailer weight on the tongue. Next, make certain the rear of the tow vehicle is not overloaded. Then check for wheel wobble on both vehicles caused by bearing failure, loose lug nuts or loose spindle nuts. Now check the tow vehicle's suspension alignment. Finally, make sure that you are not exceeding the recommended maximum speed limit for safety. If the above instructions have been followed, instability should now be corrected. If not, something may be wrong with your tow vehicle. Caution: Never increase speed when trailer is swaying or whipping. Place your hand at the bottom of the steering wheel. While watching in your outside mirrors, if you want the rear of the trailer to go to the right, move your hand to the right. If you want the rear of the trailer to go to the left, move your hand to the left. If the trailer starts to jackknife - STOP- pull ahead to straighten out then start procedure over again. When making turns , be aware the trailer will tum quicker than a tow vehicle. Allow extra turning space so that the trailer wheels don't jump over a curb, hit a soft shoulder, road sign or tree. Your axle and/or tire and rim can be severely damaged as a result or from hitting the curb at a bad angle and too hard. Caution: Trailer turns quicker than tow vehicle. Allow extra turning space for trailer. Most automobile and some homeowners insurance policies will provide some coverage for cargo trailers. They should also provide for you a "grace period" of a set number of days from the date of purchase. For safe towing it is the trailer owner's responsibility to CORRECTLY MATCH the combination of tow vehicle and trailer. Match the maximum trailer weight allowed for the tow vehicle to the GVWR of the trailer. Match the hitch weight carrying capacity of the tow vehicle with the loaded tongue weight of the trailer. This is generally 10% of GVWR on tag models and 20% of GVWR on 5th wheels and Goosenecks. Tag models may require a weight distributing hitch with sway controls. Contact your hitch specialist to properly set up your towvehicle/ trailer combination. Match the size of the brake controller to the number of braking wheels on your trailer. These are sold usually as 2 to 4 wheel brake or 2 to 6 wheel brake units. 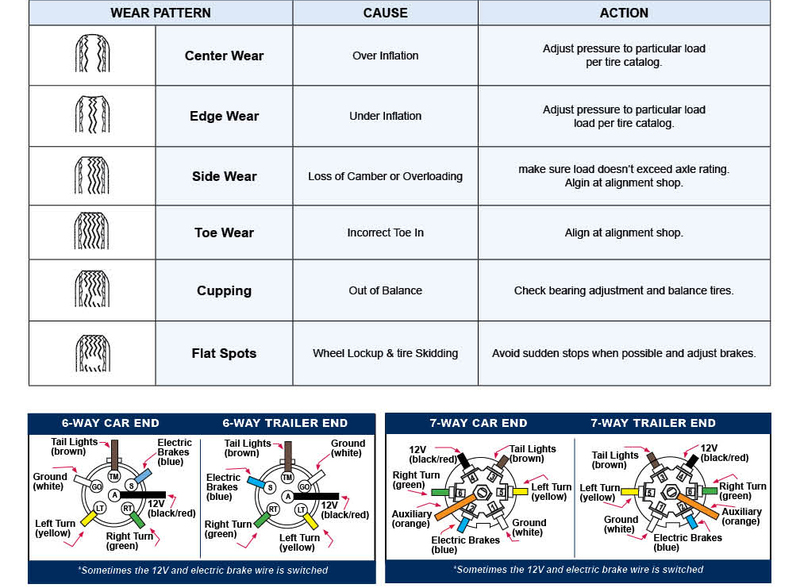 For proper controller adjustment, see your brake controller manual. Match the wiring of the tow vehicle to the wiring code on the trailer. Ensure your towvehicle does have a ground wire running from the receptacle to the frame. Match the ball size to the coupler size. Match your Fifth Wheel or Gooseneck trailer to a correct and compatible hitch provided by your hitch specialist. Then consult your hitch specialist for proper maintenance of the hitch assembly. Match your rear vehicle suspension to the loaded hitch weight of the rear axle of the tow vehicle. All marginal situations should be corrected for safe trailering. Remember, you are the one that will be trying to control a large combination of weight and size at high speeds. It is your responsibility to set up tow vehicle/ trailer properly. Contact or confirm your set up with a local hitch company professional. Check the coupler or kingpin for fatigue, damage, cracks or missing parts before towing. Test the lock mech­ anism for complete and correct latching so the trailer will not come unhooked. For ball type couplers, make sure the coupler and ball size match. If you are using a bumper hitch type coupler, it is recommended to put a bolt or similar device through the latch mechanism when hooking to the tow vehicle for safety. For more information, go to the Owner's Manual and see the Proper Hitching Techniques section. Hitching up a trailer to your tow vehicle is usually a one-person job, but it is easier if someone helps you. Back your tow vehicle as close as possible to the trailer. It is easier and safer to do this than it is to pick up and pull the trailer to your car or truck. Release the coupler locking device. Raise the front end of the trailer. Place coupler directly over the hitch ball then lower it until it is seated on the hitch ball, covering it completely. Check under the coupling to ensure the ball clamp is below the ball and not riding on top of it. Latch the coupler to the hitch ball. Make sure it is locked in place by lifting up the trailer tongue. If the coupler comes loose from the ball, unlatch it and go back to Step 3. Make sure your jack is fully raised. If you have a weight distributing hitch with spring bars, follow the above procedures. Then attach the spring bar chain to the trailer and tighten it until your trailer and car are in normal, level position. If your trailer has a surge brake breakaway cable or chain, attach the cable or chain to your towvehicle, allowing enough slack for you to make tight turns. Connect the trailer wiring harness to the lighting system of your towvehicle and check its operation.